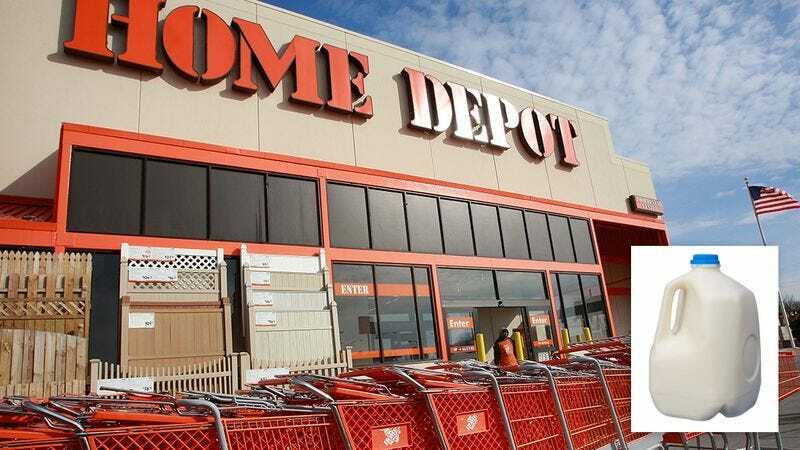 If you’re a regular Home Depot customer, you’ll definitely want to know about this before you shop there again: The hardware company is in some seriously hot water thanks to the fact that it was just caught selling milk to one customer. According to a leak from an internal whistleblower, the company placed a gallon of milk inside a cardboard box, put a barcode on the milk that would make it come up as “WHITE HAMMER” on a customer’s receipt, and put the box containing the milk toward the back of a hammer display at a Bridgewater, NJ location. Yikes. How did they think they were going to get away with this? As you might expect, Home Depot has been in complete crisis mode since the story broke this morning. The company’s CFO and head of PR have both resigned, and the board of directors had little choice but to immediately come out strongly against the choice to sell one gallon of milk. The company’s apology begs the question: Is Home Depot genuinely sorry for trying to sell milk to one customer, or are they just sorry they got caught? It’s something customers will now have to ask themselves—and Home Depot might not like the answer. So, yeah. This is really bad news for the nation’s largest home improvement retailer, and it will certainly be a story to watch in the coming weeks.